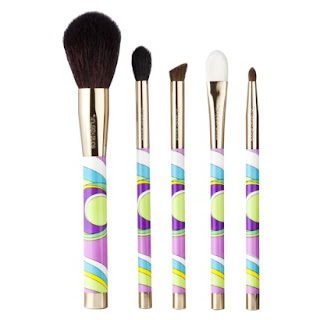 Back in April, I bought this Sonia Kashuk five-piece brush set from Target. Mainly because I needed new brushes but the Pucci-esque print really caught my eye. According to Kashuk in the May 2012 edition of Lucky Magazine, these are the 5 makeup brushes every woman should own. "The big one is airy, so both blush and powder go on subtle and natural. The smudger diffuses any liner into hazy perfection. The angled crease makes shadow go on in the perfect shape. The domed shadow blender also works to spot apply powder where your shiny. And the concealer brush is synthetic, so it smooths on foundation like nothing else." Sonia Kashuk Brush Couture Five-Piece Brush Set, $15 Target.